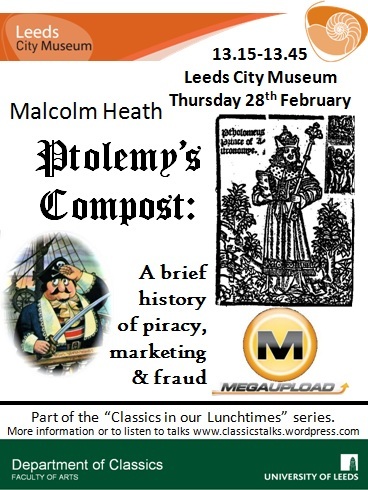 With the help of two ancient Ptolemies and a sixteenth-century publisher, Malcolm Heath explored the history of authorship and authenticity, intellectual property and piracy, from Odysseus to Megaupload and beyond. The talk raised a number of issues surrounding changes in access to information from manuscripts to print and development of “authors’ rights” that are increasingly relevant to the digital age in which we live. The talk was welcomed as intellectually stimulating and proved to be eminently topical, as on the day of the talk and on Friday 1st March the UK High Court blocking of a number of file-sharing sites that infringed copyright legislation was reported (read the BBC article; about the High Court response to requests from EMI and Sony; about the six Internet Service Providers being asked to block the sites; a song-writer’s perspective on the blocking). Ptolemy’s Compost is a sixteenth-century codex, a copy of which is held in the Special Collections of the Brotherton Library, University of Leeds. Malcolm Heath has previously mentioned this book in talks to the Astronomical Societies of Bradford and Hull, one of which can be listened to through this post, with some further details on the Other Talks page.